The Ocean King 88 is built on the base frame of a true ocean going tug. It has the same hull structure and base systems found in the tugs with changes to make her better suited to yacht use than you can find in a converted tug. 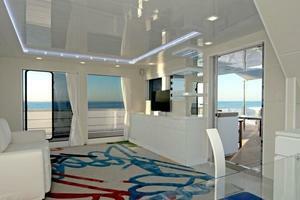 She has 2475 sq ft of interior living space making her a true home on the water. The exterior space is 2690 sq ft , combined it is 5165 sq ft, which is much larger then her closest competitors. 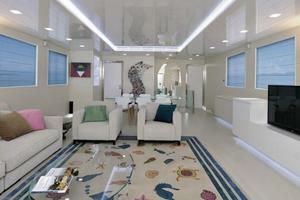 West Florida Yachts would love to guide you through a personal showing of this 88' Ocean King 88 2020. 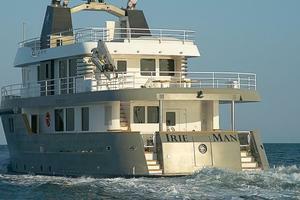 This yacht for sale is located in Chioggia Italy and priced at $6,350,000. For a showing please contact us by filling out the form on this page and we will get back to you shortly! The use of highly reliable commercial systems and no nonsense outfitting reduces down time and operating costs. 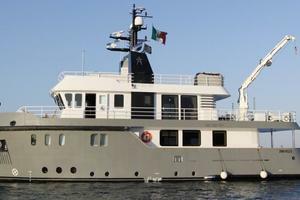 The Yacht will be built in accordance with the requirements as from the Italian Directive in force on the date of the signature of the agreement and directive “Recreational Craft Directive 94/25/CE” and in accordance with “RSG Guidelines”, Design Category “A”. Double bottom steel hull with integral tanks. All the tanks shall be structural. 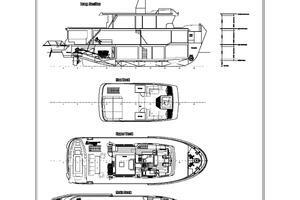 The double bottom shall be extended from the collision bulkhead to the transom, excluding the area reserved for the engine room. Proper holes shall be drilled in the keelsons, floor plates and currents to enable the easy drainage of liquids. The tanks included in the double bottom shall be provided with a proper number of manholes for inspection and cleaning. All the tanks shall have drainage. The fresh water tanks shall be treated with products suitable for the conversion of running water. The external decks will be covered with Natural Teak 12 mm thickness glued with vacuum technology, with a reasonable uniformity of the color. 14 portholes with frameS in AISI 316 Steel, brand SCM or similar diam. 300 mm with tempered glass and polished stainless steel glass list and security aluminum coverS painted white. On request in accordance with RINA rules, some portholes can be open type with alarm sensor on Automation plant, if necessary. 28 Windows with sealed glass ,dark grey color thickness glass 10 mm. wo MAN D2842 LE 412 rated @ 1800 rpm 588 Kw continuous commercial duty marine diesel engines, four stroke, 12 cylinder V , turbocharged , intercooler with mechanically controlled fuel injection. The base material shall be mineral wool with a density of 50 Kg/m3 and a variable thickness ranging from 50 to 100 mm, according to the different needs. The soundproofing system shall mainly consist of two types of treatment: either a sandwich of two layers of low-density mineral with a sheet copper layer in between, or a simple layer of mineral wool, according to the areas to be protected as well as the needs. In both cases the final overlapping of a holed aluminum sheet shall be foreseen. 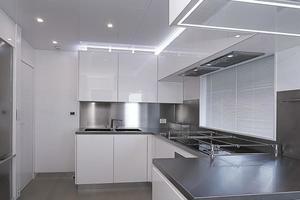 The insulating material shall be connected to the walls with metal nails either welded or glued to the structure. Estimated sound levels at Cruise speed at 11 knots with all normal services and air conditioning not in operation are as follows. Fuel transfer system from tanks (six) to day tanks (two) with pre-plumbed professional 400 V - 50 Hz pump ‘Gianneschi’ mod. CP30 0,37 Kw at 1450 rpm. All the valves for transfer operation are with electrical actuators and will be controlled from the Automation plant through touch-screen monitor in the main switchboard in engine room and/or in pilothouse. Sea water cooling open circuit for engines and generators, riser type with heat exchanger - brand Co.Fe.Me or equivalent. The pipes shall be in Aisi 304 steel and galvanized steel. All pipes shall be in galvanized steel. On request a RWO purifying system for bilge water is installed. One tank for black water with a capacity of 1,500 liters, with shore pump-out capability, and pre-plumbed pump for overboard discharge capability. WC discharges shall be collected in appropriate tank provided with a breather at the shaft top, with a flexible pipe and deodorant filter and treated through a purifying plant with Hamman or Tecnicomar, dimensioned for the number of people who can be embarked. All pipes and accessories shall be realized in Stainless Steel AISI 316 in engine room and in PE-HD outside engine room. One tank for grey water with a capacity of 1,500 liters. Gray water from the shower, basins, kitchen and food stores, laundry shall discharge via gravity into the collection tank. The gray water shall be directly discharged outboard or to the treatment plant. All pipes and accessories shall be realized in DRAIN 316. One professional fully foldable telescopic knuckle type crane with articulated boom: capacity 900 Kg at 5.5 mt. brand: HS Marine mod. AK7. Optional Remote controller. The plant consist of 1 water cooler block, with heat pump. The Fan coils shall be placed in the insulated rooms for water/air treatment. 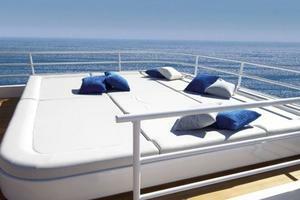 CONDARIA brand or Similar with 240.000 BTU/h capacity with UTA for lower deck + 30 Kw boiler. The plant will be monitored from Automation plant on board. A compressed air power station shall be foreseen and planed in A.M., which will provide low pressure air (about 7 bar) for any automatism and board services. For such a plant an air cooled E/compressor, an air dehydrator filter and a tank with a capacity of 100 lt at 7 bar pressure. 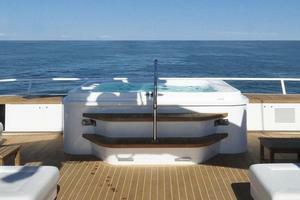 The installation shall be splash proof in the interior and totally water proof at the exterior. All cables will be numbered and marked on the drawings. All the low tension cables and those for radio frequencies are laid separately from those at 220/400 V. When it is not possible, the cables with the same degree of insulation are used for Diesel Generators. 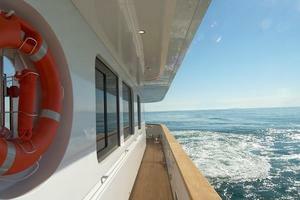 A state of the art Automation Plant will be installed on board, Brand BOENING with 3 touch screen monitors 19” and 2 touch screen monitors 15” in pilothouse. This integrated bridge, control of many system and integrated with FURUNO navigation technology ( GPS, Radars, Autopilot, Chart Plotters etc.) grant a professional bridge look. Paint will be ‘International Marine Paint’ . All painted surfaces will be free of dust, runs and orange peel. 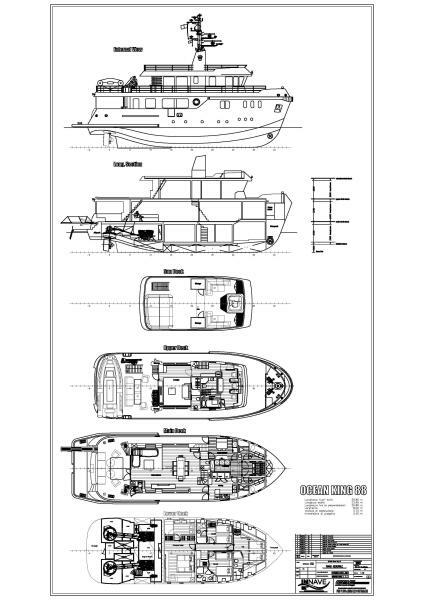 All interior layouts will be realized in accordance with General plan ‘Ocean King 88’ signed at the moment of business agreement. All materials, woods, surfaces finishing, varnished or painted parts, upholstery, leather, hardware etc, will be presented to Owner for approval before starting of building interiors. All interior of furniture lockers, will be matt wood paneled, provided with clothes hanging devices and divided in areas with drawers and shelves following the Owner requests. All interior of furniture lockers, will be mat wood paneled, provided with clothes hanging devices and divided in areas with drawers and shelves following the Captain requests.